Is your team aiming to make an impact by volunteering together multiple times per year? Partner with Activate Good to create your Service Calendar, and we’ll do the legwork for you for the whole year — whether your team wants to volunteer sporadically, quarterly, monthly, or even every week. For each service project date on your Calendar, we’ll vet causes and projects that fit your team’s interests and size and coordinate and schedule activities. For additional project management support, we can provide leadership on location. Optionally, our online volunteer sign up system is available to manage registrations. Event photography and a post-project report are also options, so you can share project impacts with your team. Depending on your team’s budget, activities on your Service Calendar can include Portable Projects brought to your office, Off-Site Projects at a nonprofit or school partner’s location, or even “dream projects,” where your team will work together to complete a huge project that will make a deep impact for a cause in need. 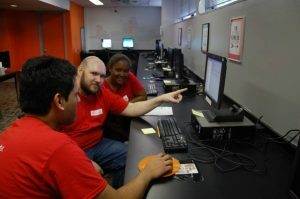 Not only do nearly 200 Red Hat employees use ActivateGood.org to connect with everyday volunteer opportunities, but the company also partners with us to facilitate team building service opportunities throughout the year. We help connect teams ranging in size from 5-200 with volunteer opportunities near Red Hat Tower in Downtown Raleigh. In 2017, we connected Red Hatters to a dozen volunteer events! Fill out our Service Calendar Request for Proposal here!